Torquing the wheels on your RV and tow vehicle. So many RV'ers that I talk to have never retorqued the wheels on their RV or tow vehicle. Most of us have probably watch Youtube movies where wheels have come loose and roll past or of to the side. This can very well happen and it is a good habit to re-torque the wheels every so often. Not only re-torquing the wheels, check the tires and maybe even give the wheel bearing a shot of grease. Just checking the overall wheel assembly. I always crawl under my RV and truck making sure all is in order and looking for something out of the ordinary. To re-torque the wheels you need the proper tools and doing it right is important. If it is not tight enough, the wheel can come loose and if you torque the wheels too much you can strip the threads. 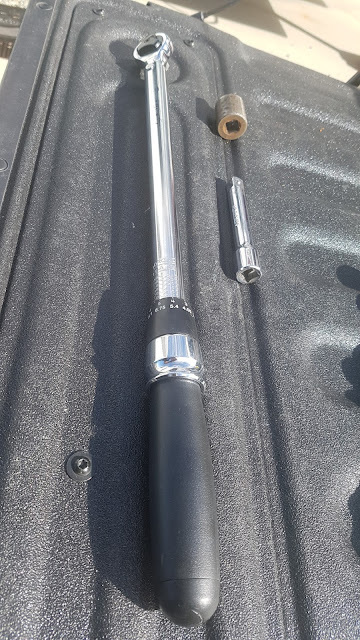 Check in your local auto supply shop for a sale on torque wrenches. You need one of those for sure! I bought mine at Canadian Tire on sale 60% off. Check your manual or with your RV dealer how much the wheels should be torqued to. For my tow vehicle; 2017 Ram 3500 Longhorn I torque the wheels to 135 ft-lb. On our fifth wheel trailer, I torque the wheels to 125 ft-lb. 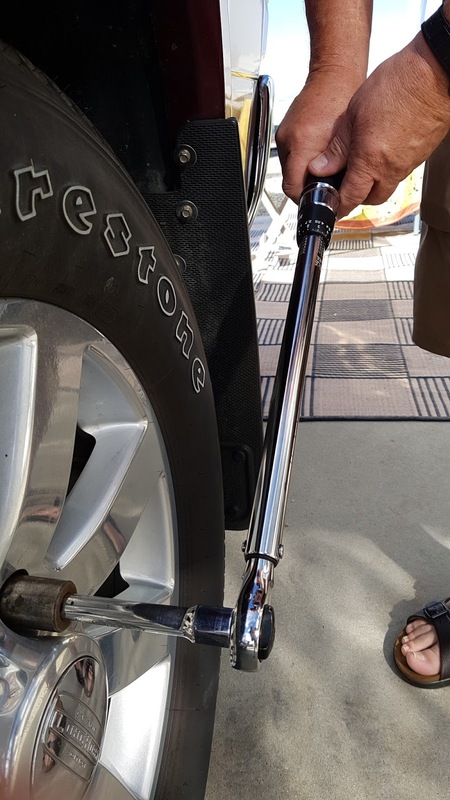 Note that the lug nuts, hardware seats, and studs should always be free of grease, oil or dirt. It is the friction between the hardware seat that determines the torque needed. If you oil any part you will not have an accurate reading and you can strip the threads or even break the lug nut. If you are not sure if your torque wrench is working properly, take it into your tire shop, they might be able to check it for you. I take mine to my local Kal Tire shop. For our fifth wheel trailer, I need a thin walled socket for the lug nuts. A regular socket does not work. This is something you may also want to check in to.